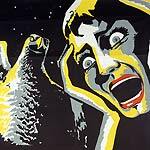 Menu screens from three forthcoming British horror releases from Optimum (Night of the Eagle, Peeping Tom and Circus of Horrors) can be found here. All three films are presented in 1.78:1 format, with anamorphic enhancement. In the case of Peeping Tom and Night of the Eagle, quick comparisons with the earlier Studio Canal discs suggests that the new discs feature the same transfers as the old UK versions. Menu screens from disc one of 2 Entertain's Primeval DVD set can be found here. The menus are fugly. 2 Entertain's forthcoming DVD of the BBC's mind-warping fantasy Artemis 81 will feature a commentary track by writer David Rudkin and director Alastair Reid. 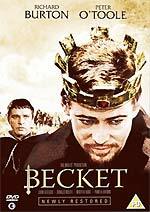 Details of Second Sight's forthcoming DVD edition of Peter Glenville's 1964 historical drama Becket, which stars Richard Burton and Peter O'Toole, have been announced. The film, which was nominated for twelve Academy Awards, will be released on DVD worldwide on May the 14th. The film has recently been restored, by Martin Scorsese's Film Foundation and the Academy Film Archive. The audio has been restored from "an advanced state of decomposition and shedding" by Chace Productions, and will be offered in its original mono format, or in newly-created stereo and 5.1 mixes. The disc will feature a commentary track by Peter O'Toole; an interview with film editor Anne V. Coates; A Tapestry of Music (an interview with composer Laurence Rosenthal); and a lobby card gallery. Further down the cast list you'll find a host of favourite British character actors, including Geoffrey Bayldon, Patrick Newell, Peter Jeffrey, Tutte Lemkow and Edward Woodward. A website supporting the release, where you can read more about the restoration process, can be found here. 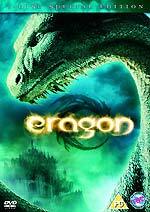 Full details of Fox's two-disc edition of the fantasy epic Eragon are now available. The film is presented in anamorphic 2.35:1 format, with a choice of Dolby Digital (at 448kbps) or DTS (at 768kbps) 5.1 audio tracks. There's also an Audio Descriptive track, and a commentary track by director Stefen Fangmeier. There are English HoH subtitles for the film and commentary. Disc one also features seven deleted or extended scenes, running for about thirteen minutes. These have optional commentary, too. The disc also features trailers for Night at the Museum, The Hogfather, The Simpsons Movie, Fantastic Four - Rise of the Silver Surfer, and a generic kids trailer featuring various Fox and MGM titles. There's also a trailer / advert / featurette for the Eragon video game (3m), which you could count as a legitimate bonus feature. The press release also mentions Ed Speelers auditions (sic) as being on disc two, but I either missed it, it's not there, or it's hidden as an Easter Egg.